The VHC138 is an advanced high speed CMOS 3-to-8 Decoder/Demultiplexer 74VHC138 fabricated with silicon Gate CMOS technology. It achieves the high speed operation similar to equivalent Bipolar Schottky TTL while maintaining the CMOS low power dissipation. When the device is enabled, 3 binary select inputs (A0, A1 and A2) determine which one of the outputs (O#0-O#7) will go LOW. When enable input E3 is held LOW or either E#1 or E#2 is held HIGH, decoding function is inhibited and all outputs go HIGH. E3, E#1 and E#2 inputs are provided to ease cascade connection and for use as an address decoder for memory systems. An input protection circuit ensures that 0V to 7V CAN be applied to the input pins without regard to the supply voltage. 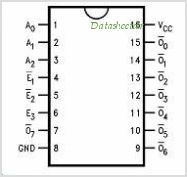 This device CAN be used to Interface 5V to 3V systems and two supply systems such as battery back up. This circuit prevents device destruction due to mismatched supply and input voltages. This is one package pinout of 74VHC138,If you need more pinouts please download 74VHC138's pdf datasheet. 74VHC138 circuits will be updated soon..., now you can download the pdf datasheet to check the circuits!